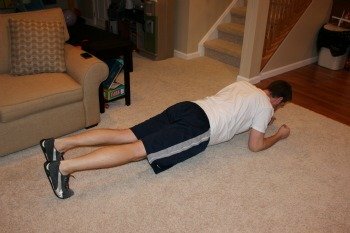 When designing your core strengthening program, there is one category of exercise that needs to be included: the plank! 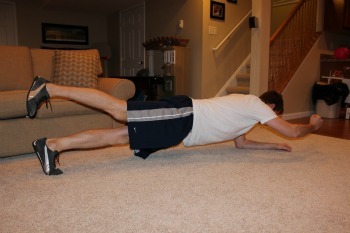 If you are unfamiliar with the plank exercise, it is when you are lying face down on the floor and you subsequently prop yourself up on your forearms and toes. The goal is to keep your entire body in a straight line (hence the name!) and to keep the rest of your body off of the ground. The great aspect of this exercise is that it works multiple muscle groups at once including the abs, low back, hips, and shoulders. Also, it can be performed my practically anyone! If done properly, there should be minimal motion at your spine which makes it ideal even for people with preexisting low back conditions. 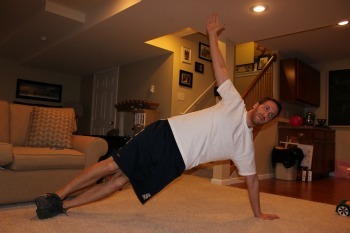 The variations that the plank exercise provides you are practically endless as well. The amount of time which you maintain the plank position can always be changed, especially as you get stronger. Also, additional movements can be combined with the standard position such as upper extremity reaches or alternating leg lifts. This page with show you exactly how to perform this excellent core strengthening exercise plus some of the more common variations. 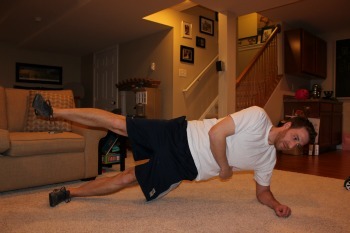 -Start by lying face down on the ground, with your forearms tucked underneath of your shoulders. 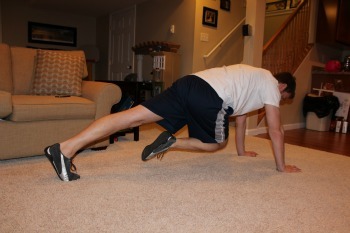 -Prop yourself up on your forearms and toes, elevating the rest of your body up off of the ground. -Hold this position, focusing on keeping your entire body as straight as a board. 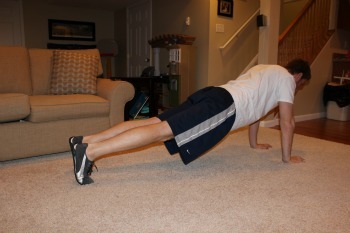 -Assume the standard plank position, but this time lift one arm off of the ground and and reach forward. Return this arm and then repeat with the other arm. Do as many reps as you can before fatigue! -Another variation would have your slowly lift each leg off of the ground in an alternating pattern, keeping your knees straight. -From the standard position, bend your right hip and knee and try to bring your knee close to your right elbow. Alternate sides. -From the starting position, slowly elevate your right arm and left leg. -From the starting position, slowly elevate your right arm and right leg. 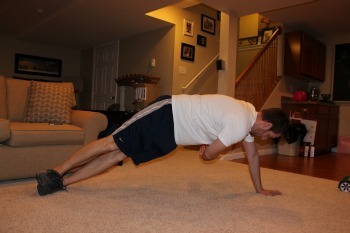 A high plank exercise is essentially the starting position of a push up. 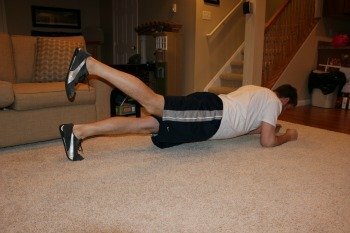 All of the above low plank variations can also be performed in this position as well if you are looking for more of a challenge. The exercises below are specific to the high plank position. -For this version, bend your right hip and knee and try to bring them to your left elbow. This is more advanced and, depending on your flexibility level, may require some trunk rotation in order to complete. Alternate sides. -Assume either the high or low position depending on your skill level. Slowly drop your hips closer to the floor and then raise them back up to the starting position. -Repeat to the other side. -Begin in either the high or low position. 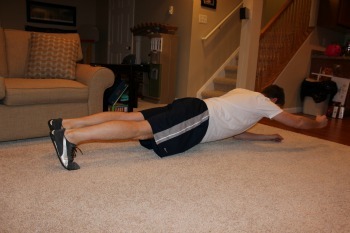 -Maintain the plank, but repetitively lift your top leg to the ceiling. -Once you are finished with one side, flip and perform to the other side as well. -Begin in the high position, with your top arm pointed towards the ceiling. 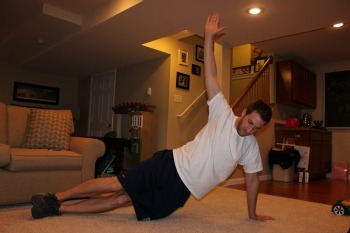 -Bring your top arm forward and down while at the same time beginning to rotate at your trunk. 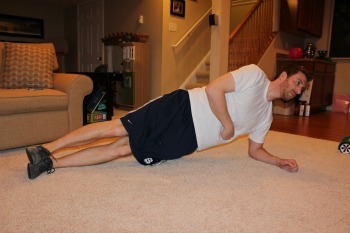 -Curl your top arm underneath of your body and around your chest, with your trunk now facing the ground. -Return to the starting position and repeat. Perform on both sides.